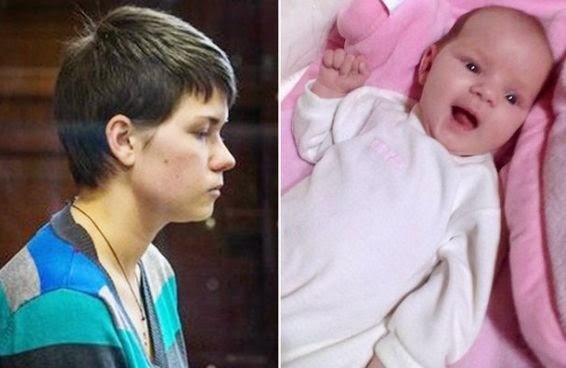 19 year old Russian woman Alyona Ipatova (pictred left) who left her five-month-old baby to starve to death while she went out partying for two weeks has been sentenced to a minimum of 10 years' hard labour. Alyona, dubbed 'Monster mum' by Russian media admitted in court to leaving her baby alone in her apartment in Russia and went partying for two whole weeks with friends. Prosecutors said when the teen got back, she found her infant daughter(pictured right) dead. "I really regret what I did. I did not want that to happen. I realise what I have done," she told the sentencing hearing. Her lawyer claimed she had asked the child's father to help look after their daughter. "Yes, she left the child at times. Although she left her, sometimes she came back in the morning or the father was at home, so he could still look after the girl," he claimed.